With our salmon, there are four basic steps involved in bringing you the highest quality frozen salmon. 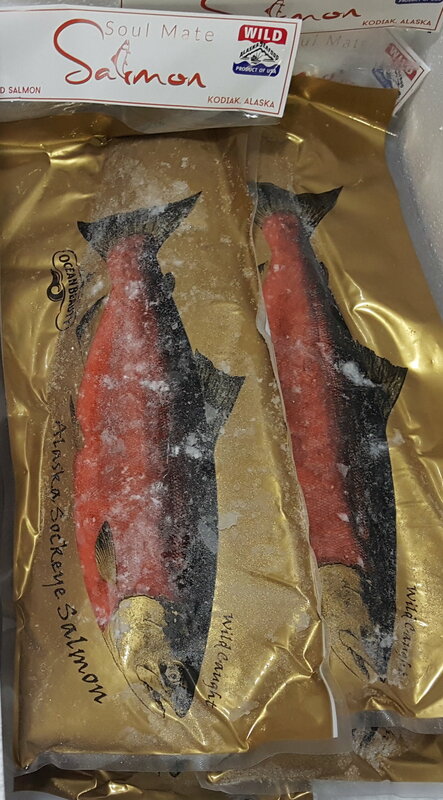 First we catch it and bleed it, then submerge it in slush ice or 33-degree circulating refrigerated sea water until it reaches the processor in Kodiak, where it's filleted, vacuum sealed and blast frozen, which keeps it in its pristine state until you are ready to enjoy it in a delicious recipe. The superior quality of frozen salmon is something we've been talking about since Soul Mate Salmon started, and now there's a new study out (read it here) that provides cold, hard evidence (pardon the pun) that frozen salmon is indeed preferred by educated consumers, as opposed to fresh salmon, and that it is quantifiably of higher quality when looking at cell structure. Read a news article here. Contrary to a popular misconception, frozen salmon is not second best to fresh, and in fact it is better! The technology for keeping our beautiful salmon in such pristine shape until you're ready to eat it is vastly different from the freezers we have for home use. The state-of-the art freezers at our fish processor take the the salmon to a frozen state so quickly that there is minimal time for the cell structure to change. The flesh remains firm and perfect, with no gaps in the meat or softness. In contrast, sometimes what is sold as "fresh" seafood in markets has traveled many thousands of miles, or it is thawed previously frozen fish, and who knows how long it has been sitting. It can easily become mushy and it starts degrading in quality the longer it sits out. Please stay away from farmed salmon, raised in dense net pens, fed antibiotics and a pesticide to ward off parasites and disease, with its flesh dyed pink. It's scary that the FDA recently approved allowing a company to grow genetically engineered salmon, splicing in eel pout genes to be able to get them to market more quickly. Read about that here. There is some food for thought. Bringing our beautiful fish from Alaska is certainly a challenge - avoiding bruising (to both the fish and ourselves) in the boat in heavy weather, then maintaining the chill and frozen state all the way to your table - but it is worth honoring this amazingly healthy source of protein and sharing it with other appreciative souls from Minneapolis and beyond. Eat wild, be healthy!